Applications are invited online only through ONE TIME REGISTRATION scheme from qualified candidates for selection to the under mentioned post in Kerala Government Service. The Ranked List published by the Commission in response to this notification shall remain in force for a minimum period of one year provided that the said list will continue to be in force till the publication of a new list after the expiry of the minimum period of one year or till the expiry of three years whichever is earlier. Candidates will be advised from the said list against the vacancies reported to the Commission in writing, during the period of currency of the list. Those who are appointed in the post should serve for four (4) years during the first ten years of their service (including the period of training) anywhere in India or any other foreign country under defence service or services connected with defence, if required. Those who have completed forty five years of age are exempted from the above Compulsory Military Service. 6. Age limit : 21 – 46, Only candidates born between 02.01.1970 and 01.01.1995 (both dates included) are eligible to apply for the post. Candidates from other Backward Communities, Scheduled Castes and Scheduled Tribes are eligible for usual age relaxation. The concession in upper age limits are available subject to the conditions that the maximum age limit shall in no case exceed 50 (Fifty) years. (i) Medical Post Graduate Degree such as MD/MS from a recognised University or DNB in the concerned discipline. (ii) Three years Teaching Experience or such other teaching experience as prescribed by the Medical Council of India. (i) Rule 10 (a) ii of Part II of the KS & SSR is applicable. (ii) The Post Graduate study period for Medical subjects will be considered as teaching experience for appointment as Assistant Professor provided the candidates have undergone Residency Programme during the Post Graduate Course period and in the case of candidates who have passed the Post Graduate course without undergoing residency programme a certificate shall be produced by the candidate from the Principal of the College to the effect that the candidate has got teaching/clinical work experience during the Post Graduate Course period. 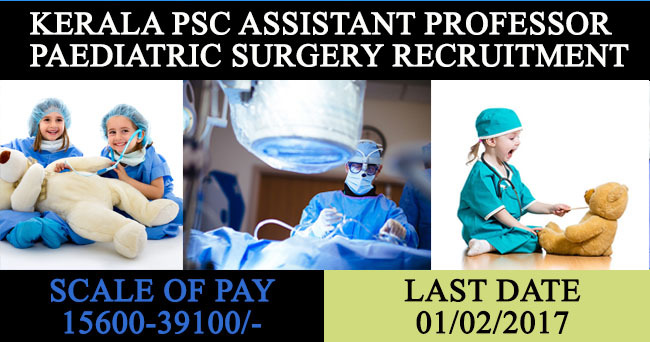 (ii) Permanent Registration under State Medical Council (TCMC) will be considered for the post of lecturer in the Scale of Pay `15600-39100/- with grade pay of `5,400/-Note:- (i) Rule 10 (a) ii of Part II KS & SSR is applicable. (a) Candidates must register as per 'ONE TIME REGISTRATION' with the official Website of Kerala Public Service Commission 'www.keralapsc.gov.in'before applying for the post. Candidates who have registered can apply by logging on to their profile using their User-ID and password. Candidates must click on the 'Apply Now'button of the respective posts in the Notification Link to applying for a post. The Photograph uploaded should be one taken after 31.12.2010. Name of the candidate and the date of taking photograph should be printed at the bottom portion. The photograph once uploaded meeting all requirements shall valid for 10 years from the date of uploading. There is no change in other instructions regarding the uploading of photographs. No application fee is required. Candidates shall take a printout of the application by clicking the link Registration Card in their profile. Candidates are responsible for the correctness of the personal information and secrecy of password. Before the final submission of the application on the profile candidates must ensure correctness of the information on their profile. They must quote the User-ID for further communication with the Commission. Application submitted is provisional and cannot be deleted or altered after submission. The application will be summarily rejected if noncompliance with the notification is found in due course of processing. Documents to prove qualification, Experience, Community, age etc. have to be produced as and when called for. (b) If a Written/OMR Test is conducted as part of this selection, Admission Ticket for eligible candidates will be made available in their Profile for One Time Registration and the date of downloading will be included in the Examination Calendar. Candidates can download Admission Ticket for 15 days from this date. Candidates who have downloaded the Admission Ticket will alone be permitted to attend the examination. (c) Candidates who have AADHAAR card should add AADHAAR card as I.D. Proof in their profile. 9.Last date for submission of application:- 01.02.2017 Wednesday up to 12.00 Midnight.